I could go on and on about this article but the best thing to do is just shut up and let you read it and offer opinions if you want to. The headline seemed promising. The author ignored the Goldman Sachs estimate about the market size for Virtual Reality. ... and failed to learn to embrace change. I imagine that the author of the article will not be attending this VR Masters Class because he will be searching for spare parts for his Sony Betamax. Thought the piece was a neutral, semi-informative article. What I've wondered about the past few months is, is all this new VR stuff going to ebb and flow like stereo photography has since the mid 1800s? Cardboard is nothing more than the stereopticon invented just a few years after photography came into being connected to the interwebs. It has seen various heydays - remember the view master? the nimslo? Is it here to stay or another iteration of technology that does more than the market really wants done? Matterport models and Google Street View are still the only real VR experiences I find fascinating. I got burned out of 360 panoramic videos and photos quite a while back. In a Matterport model and Street View, you are inside real worlds world you explore. You can navigate through a 3D VR game, but that's a model someone created. John Carmack is a strong proponent of VR. He's Oculus's Chief Technology Officer. John Romero called VR a fad. Carmack and Romero helped usher in the era of 3D gaming and 3D computer graphics after launching ID software and inventing DOOM and Quake eons ago. Funny how those two "VR" experts have such different visions of the future. Facebook, working with Carmack, wants everybody to have VR gear. Besides Romero, others such as the head of Nintendo in America, perhaps think that VR fever will fade. Some VR negatives some cite are the way people isolate themselves in VR and the requirement to keep turning your head to see everything around you. My game controller helps you rotate 360 degrees in Oculus Street View VR. I don't have to keep my hand to my head manipulating Gear VR's button when my finger can simply press my controller's keypad. I'd love for the controller to work in Gear VR models. If I wanted to see what's behind me, I wouldn't have to turn my head 180 degrees. Imagine yourself sitting in chair inside a Matterport model home. In your lap is your navigational pad. Press left and the chair rotates left. Press right and you rotate in the other direction. Gaze at one of those circles, press the controller's "Fire" button and you move in that direction. That part works with my controller. I seem to navigate more quickly because I don't have to wait for the circle's color to change completely. If the controller's other buttons worked in a model, the way they do in the Oculus Street View VR app, moving through a Matterport model would almost feel like playing a video game. Since the keyboard and mouse manipulate the model when you view it on a computer monitor, I'd guess that Matterport programmers could get the model to respond to game controller input that Gear VR users provide. Here's a link to Oculus Street View VR. It's quite a step up from the Cardboard Street View app. Street View has some interior business shots which you may have seen in regular Street View. Explore those in Gear VR and you'll see similarities to Matterport models. Those models are higher quality than Street View images and you usually have more ways to move in a Matterport model, but they're both "VR" -- virtual representations of things that really exist in reality. 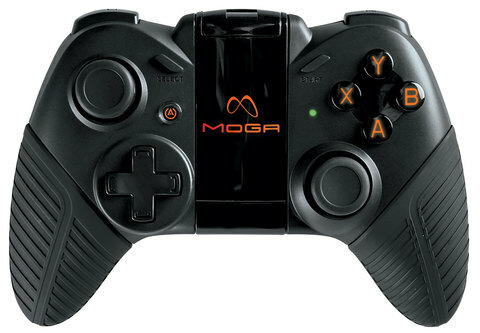 Here's what my Moga gamepad looks like. Quite a few experts recommend getting a gamepad for the Gear VR. The Gear VR's built in pad doesn't seem to have many positive reviews, and as owners see, it's not the easiest thing to use to control the Gear VR. The Gamepad also helps me navigate through the Matterport menus quickly without raising my hand and trying to tap and scroll using Gear VR's button and pad. Perhaps Matterport clients may benefit from using a gamepad while viewing Gear VR models. They certainly will eliminate the arm fatigue that comes from reaching up to press the Gear VR's button and pad. "Matterport is one of the greatest apps available for VR." He's not a realtor. He simply loves VR and the Matterport models amaze him. The article does, however, show how disappointed he that no more 3D models exist. He got to see one and apparently that was one of the greatest things he'd witnessed in his life. Someone once asked if a Matterport camera could be used to create 3D game worlds because the experience is so realistic. So, Matterport probably could play a role in real VR that extends outside the virtual tour business. Hopefully, it becomes possible for MP2VR photographers to post their models in a public gallery. The existing gallery is limited.